Firefox fox AIX 5L is build to run on AIX 5.1 or higher. You'll need GTK2 runtime installed. In opposite to the IBM provided GTK2 build of Firefox 1.5.0.12 the ones provided here are 32bit executables and compiled on AIX 5.1 so there are a lot more machines capable of running my builds. SVG is now supported on AIX 5.1 or higher. Both Java plugin and Adobe Acrobat Reader plugin are supported. For a preview look here. For CDE integration there is a CDE Type and Action with an icon. 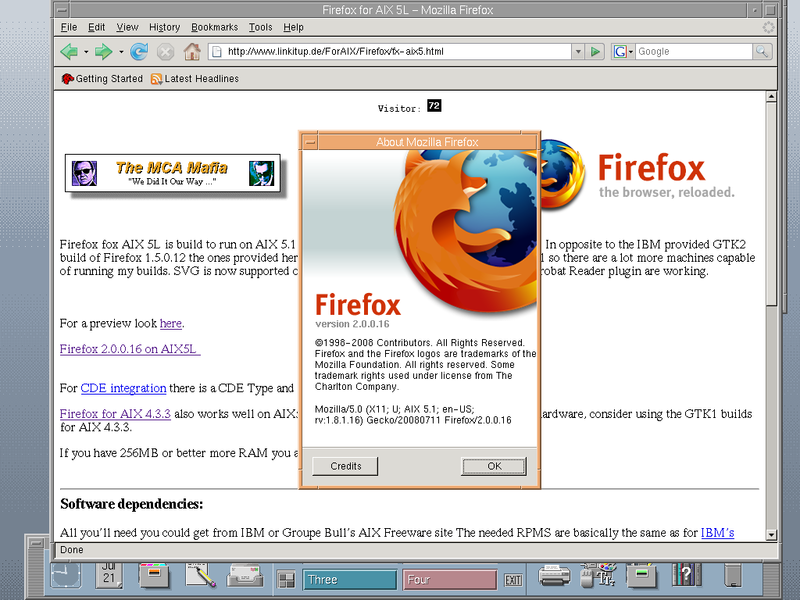 Firefox for AIX 4.3.3 also works well on AIX5L. If you are on the low end of recommended hardware, consider using the GTK1 builds for AIX 4.3.3. If you have 256MB or better more RAM you also may be happy with the Seamonkey Suite. All you'll need you could get from IBM or Groupe Bull's AIX Freeware site The needed RPMS are basically the same as for IBM's Firefox. Bull also provides more recent free GNOME desktop for AIX 5.1 or higher. The runtime predependencies are listed here. For running on AIX 6.1 you'll need X11.compat.lib.X11R6 and this little patch appending the location of the X11R6 shared lib into the wrapper script "run-mozilla.sh". 48 MB free disk space in installation filesystem after installing all prerequisites. Untar under "/opt". If you install some more from AIX Toolbox /opt can be enlarged. It depends on your machine. I have it tested on a 7006-42T with a 120MHz PowerPC 604, 256MB RAM and a truecolour GXT500 graphics adaptor. For normal useage I recommend something like a 7043P-150 and 512MB RAM and TrueColour graphics. If you want to know how Firefox is build on AIX5L or how to build it from source, go here.